Francisco Sánchez serves as the Under Secretary of Commerce for International Trade. Mark Doms serves as the Under Secretary of Commerce for Economic Affairs. This post also appears on the Department of Commerce blog. Data released today show that in 2012, American exports totaled $2.2 trillion, eclipsing the previous record of $2.1 trillion in exports in 2011. Data from the Department of Commerce show that U.S. exports in 2012 totaled $2.2 trillion, a record for American exports. 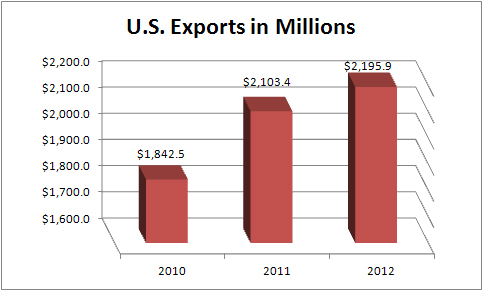 The increase in U.S. exports continues an upward trend that began in 2009. This trend has contributed to the creation of 6.1 million American private-sector jobs during the last 35 months. It is a direct result of President Obama’s National Export Initiative, part of a government strategy to strengthen our economy, support the creation of American jobs, and ensure long-term growth. We are making historic progress toward the President’s goal of doubling exports by the end of 2014. Data show significant export growth in agriculture, motor vehicles, aerospace, and travel and tourism. The U.S. also continued to dominate exports in the services industry, worth over $632 billion, an increase of $26.4 billion over the previous year. This gave us a $195 billion trade surplus for services, which is a record surplus for the services industry. U.S. businesses continue to face the challenge of slow growth in the global economy. That is why the Obama administration continues to do everything possible to support American farmers, workers, and businesses as they compete in the global marketplace. 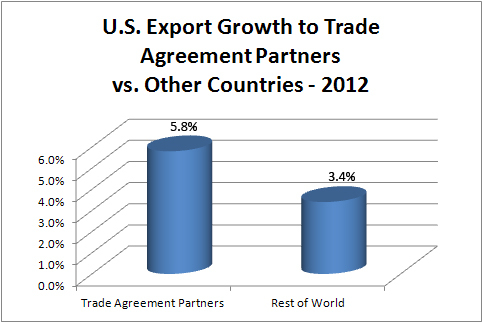 As the record data show, this work benefits American exporters and the U.S. economy. We will continue to expound on the data here on the Tradeology blog, the Economic Statistics Administration blog, and on Twitter. You can also find a copy of the data here. Elías González is an intern in the International Trade Administration Office of Public Affairs, and is a former West Point Cadet and graduate from the University of Pennsylvania. Should local governments pay attention to international trade? American trade leaders think so and they’re helping city leaders take a bite out of the export pie. International trade was a hot topic at the U.S. Conference of Mayors’ Winter Meeting in Washington, DC this month, and representatives from the International Trade Administration (ITA) used the opportunity to illustrate how U.S. competitiveness depends on local communities. Francisco Sánchez, Under Secretary for International Trade, emphasized the importance of the president’s National Export Initiative (NEI). He said that 95 percent of consumers live outside the U.S., and that the NEI is instrumental in helping American businesses access those foreign markets. He also lauded its success, citing that U.S. exports reached a record $2.1 trillion in 2011 and that data when available next month will likely show that 2012 was even higher. In a separate task force meeting, Walter Bastian, Deputy Secretary for the Western Hemisphere here at ITA, reaffirmed the importance of international trade, pointing out that trade with Mexico alone produces an average of $1 million a minute for the U.S. economy. Bastian emphasized the importance of the Trans-Pacific Partnership (TPP), a trade agreement among several Asian, Pacific, and North American countries, and how it will strengthen trade with Mexico. He said that it will help reduce the cost of doing business, potentially making that million-dollar-a-minute figure higher. Sánchez and Bastian were quick to note that the economic benefits from trade are not felt only by the U.S. as a whole, but by local communities as well. In a cooperative effort to help local communities enter the exporting business efficiently, ITA has partnered with the Brookings Institution on the Metropolitan Export Initiative (MEI). Several metropolitan areas in the U.S. are already participating, and the Under Secretary urged the mayors to utilize the tools the ITA provides. The MEI is one of many tools in place to remedy inefficiency. Inefficiency at the border—issues like long wait times for trucks—cost upwards of $6 billion per year. Initiatives like the MEI help local communities gain greater control over their exports and create more efficient and beneficial trade partnerships. Under Secretary Sánchez concluded his discussion at the conference by emphasizing that cities need to prioritize exports, reach new markets, and draw new investments. He reiterated what he and Bastian deemed crucial, that as cities succeed the country succeeds, and that ITA is here to help. APEC 2011: Twenty-One Markets, Unlimited Opportunities! Stephen L. Green is a Commercial Officer on domestic assignment with the U.S. Export Assistance Center in Honolulu and has served with the International Trade Administration since 2000. The United States just wrapped up their year of hosting the Asia-Pacific Economic Cooperation(APEC) Summit and I was fortunate enough to be on hand in Hawaii for the finale. So, what’s left after the Summit? That is the burning question on the minds of all Hawaiian people as the largest event in the State’s history comes to a close. Over the past week, dignitaries, officials, and business executives from APEC’s 21 member economies descended on Honolulu to discuss the path forward in expanding trade, investment, and economic growth in order to create employment and raise living standards across the region. And, this was not just any group. Combined, they represent 40 percent of the world’s population, 56 percent of global gross domestic product, and approximately 50 percent of international trade. No, not just any group. Rather, the world’s most powerful coalition of economies that have agreed upon promoting open trade and investment across a region spanning thousands of miles on both sides of the Pacific Ocean. The United States, China, Japan, Russia, Canada, Mexico and 15 other major economies, they were all here in Honolulu last week. What’s left after APEC? I have plenty of answers. 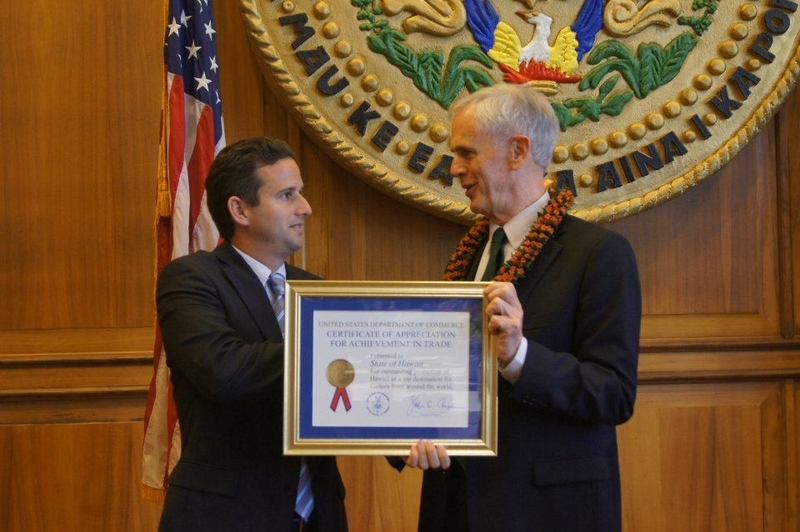 Secretary Bryson presents a Certificate of Appreciation for Achievement in Trade to Lieutenant Governor Brian Schatz recognizing the State’s leadership in promoting the Hawaiian Islands as a destination for foreign travelers. For starters, Hawaii-based companies met new international business partners. SKAI Ventures, one of our best clients, is now in deep discussions with a number of potential distributors met during APEC. And, deals were done. Sopogy, Inc., another one of our top clients, signed a memorandum of understanding with Sichuan Dongjia Investment Company outlining how this new partner will market Sopogy’s world-class micro concentrated solar power technology in China. In addition to the business deals happening at APEC, the U.S. Department of Commerce’s senior leadership honored local businesses and brought the message of expanded exports to the local economy. Recently-confirmed Secretary of Commerce John Bryson returned to his boyhood stomping grounds of Honolulu where he attended 7th grade at Kaimuki Middle School, this time for his first bilateral meetings with APEC counterparts on a range of trade and investment issues. Secretary Bryson also presented two U.S. Department of Commerce Certificates of Appreciation for Achievement in Trade during his visit; one commending the Hawaii Pacific Export Council for its role in developing export opportunities for Hawaii-based companies and a second to Lieutenant Governor Brian Schatz recognizing the State’s leadership in achieving President Obama’s National Export Initiativegoals by promoting tourism in the Hawaiian Islands as a service export. 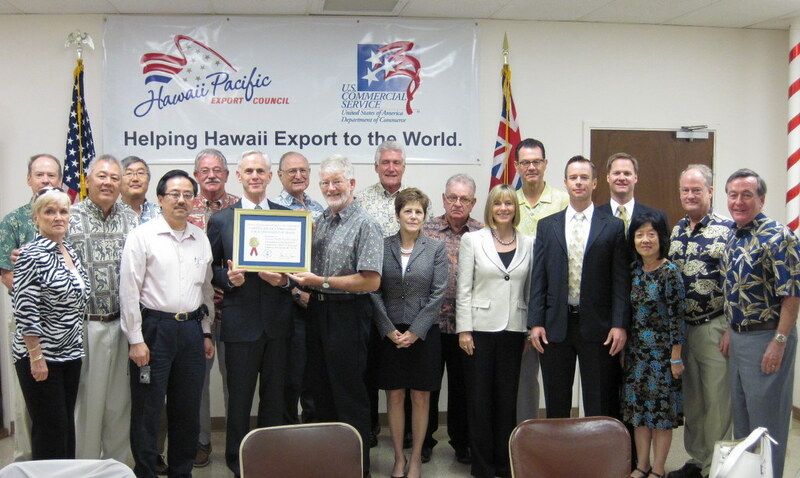 Secretary Bryson (center) presents a Certificate of Appreciation for Achievement in Trade to Hawaii Pacific Export Council (HPEC) Chairman Steve Craven commending HPEC’s role in developing export opportunities for Hawaii-based companies. Our Under Secretary for International Trade Francisco Sánchez and Assistant Secretary for Market Access and Compliance Michael Camuñez with their Indonesian counterparts launched the first-ever U.S.-Indonesian Commercial Dialogue that will pay close attention to harmonizing standards in the energy sector. And, Japan announced that it intends to join the 21st Century Trans-Pacific Partnership agreement that promises unprecedented opportunities for U.S. exporters doing business in the Asia-Pacific region. The State of Hawaii has always been a surf-and-sand tropical paradise. That won’t change after APEC but what APEC surely did is transform the Hawaiian Islands into an international commercial hub, where doing business beyond the reef is an everyday part of life. Our office, the Hawaii U.S. Export Assistance Center, stands ready to make sure Hawaii companies take advantage of this new frontier. Posted in Success Stories, Trade Agreements | Tagged certificate of appreciation, export promotion | Comments Off on APEC 2011: Twenty-One Markets, Unlimited Opportunities! Friday afternoon I got a heads-up from one of our Strategic Partnership managers, Bob McEntire, about a news report on an Atlanta television station about Secretary Locke’s visit to the UPS operations center in Doraville, Georgia. In addition to a synopsis of the visit, the report embodies the Administration’s push to promote its National Export Initiative and the benefits of the work we can do with our public-private partners. It’s good to see the private sector working progressively with the Department of Commerce to help increase exports and to create more jobs. Mary Trupo is the International Trade Administration’s Director of the Office of Public Affairs. The National Press Club is abuzz with excitement as Secretary Gary Locke prepares to roll out the National Export Initiative (NEI), unveiled during President Obama’s State of the Union Address. During last week’s speech, the president announced a goal of doubling exports over the next five years to support 2 million jobs in America. The NEI, the first of its kind, represents a government-wide export-promotion strategy in the U.S. with focused attention from the president and his cabinet. As I sit here in the throng of reporters, members of Congress and invited guests, I am struck by how much work, collaboration and passion has gone into creating this historic initiative. Much more work is ahead as we promote and engage American businesses to take advantage of the expanded programs that the Secretary just announced. I am excited to be part of this moment and know that through the efforts of the talented and dedicated global staff within ITA, we will reach the goal of increasing exports and assisting more U.S. companies who are either new to exporting or export ready, to expand into new markets.